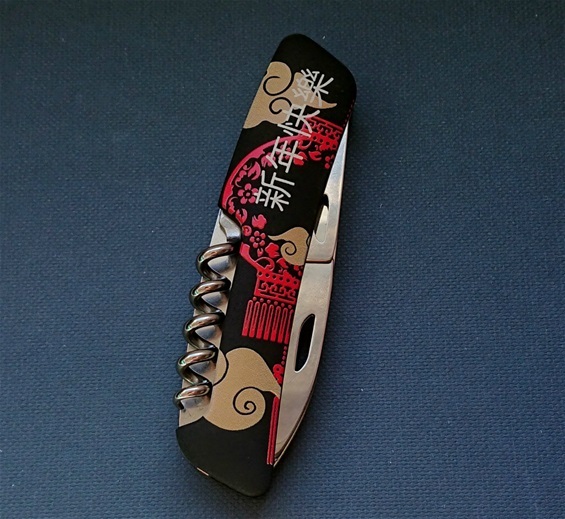 This is my latest Swiza knife and what a wonderful looking model this is. Just incredible it is. 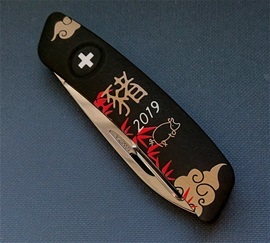 This is the D03 “year of the pig” 2019 model in black. I really enjoy the design with the decoration, colors and the Chinese symbolism. It also shows very well how the Swiza handle design and material can be used for such designations. It also tells me that Swiza is growing on the world-wide market. On the internet i found some information regarding the animal and how it represents so many aspects in Chinese culture and also the Zodiac 2019. This was new to me and I can learn from this. This is also what I have been talking about before on how Swiss knives can be educational and how personalizing can raise it further. It can reflect people’s interest, culture and history. The functionality and quality on the assembly, construction and design is 100%. It is very eye candy. I like it very much when swiss knives are used for details like this. It builds up the interest and I learn from everything. I am very surprised about the soft touch material and how it can be used for quality designs with many colors and dimensions.